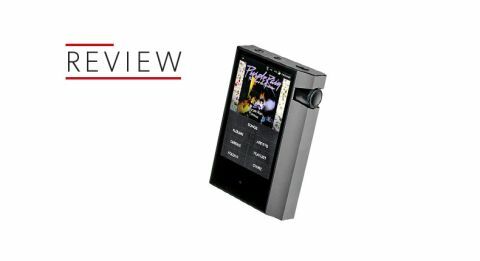 Astell & Kern AK70 MKII review | What Hi-Fi? We don’t give pet names to all products passing through our test rooms, so the fact the original AK70 has the adopted name “Misty” (after its unique ‘misty mint’ finish) in our office is a sure sign of our affection for it. It's almost as telling as the Award we gave it in 2016, in fact. Clearly we will have to think of a nickname for the mkII version too. Despite its greater cost, it is even more worthy of our adoration. Sadly, we’ll have to drop the reference to “Misty” though - the mkII ditches the green-blue colour for a more classic black finish. That’s the most obvious visual distinction between the two players, though smaller aesthetic variances include: the textured pattern on the volume dial now being waves rather than speckles, and the player’s slight increase in width (up 2.5mm), thickness (2mm) and weight (18g). That increase is down to a need to accommodate the new internals, which is where the real differences between the two models lie. While the AK70 mkII demands more of your hard-earned cash, it offers more for it too. For one, it introduces a dual-DAC design for “optimum performance” from both left and right channels. Astell & Kern says amplification has been enhanced and jitter reduced, also in the quest for improved sound quality, and the battery now has 2500mAh capacity – up from 2200mAh. The battery life of the AK70 mkII is largely the same as the AK70, though it does take a fairly big hit when streaming Tidal over wi-fi. We notice a 15 per cent drop in just 30 minutes. Unusually for a portable music player, the mkII can also double as a USB DAC, working much in the same fashion as (for example) the AudioQuest DragonFly Black to improve audio performance from a laptop or computer. Wi-fi connectivity and compatibility with Astell & Kern’s DLNA-based AK Connect App opens up network streaming, while built-in Bluetooth lets you stream music to wireless headphones or speakers if you’re so inclined. In our experience, the 64GB of internal memory is good for over 700 (mostly) 24bit hi-res files, but that can be expanded by as much as 200GB to suit those with more extensive libraries. Had the AK70 mkII supported MQA – a technology that effectively packs hi-res music into smaller files – users inclined to properly pursue hi-res music perhaps wouldn’t need to rely on such a mighty microSD card. With many rivals, including the Onkyo DP-S1, now supporting MQA, this is definitely one area where we feel the AK70 mkII is lacking. Our only other bugbear is that it can run rather warm, especially when streaming from Tidal over wi-fi. MORE: MQA audio – What is it? How can you get it? That aside, it’s a nigh-on perfect portable companion. Despite the slight weight gain over the AK70 it weighs only 150g, making it every bit as pocket-friendly as its predecessor. We’d prefer slightly rounded edges to its strictly straight ones, but we’re glad to see the re-appearance of the shimmery back panel and bright, high-contrast 3.3in touchscreen. The volume dial still clicks incrementally as you roll it forward, but this time the click action is more definite. The interface is much the same - basic, compared to those loaded with multi-tasking (smartphone-like) Android software, but comprehensive enough for a pure music player. And it's easy to navigate too. It makes searching for songs and performing playback controls a breeze, and having access to Tidal (found in the “Store” folder) is a bonus. We start our listening with Tidal, and plug a range of headphones into the 3.5mm output (there’s a balanced one too), including the Grado SR325e (£325) and B&W P3 S2s (£120) on-ears as well as Sennheiser Momentum M2IEis (£90) and Soundmagic E50 in-ears (£50). Even a Tidal stream via the E50s displays the AK70 mkII’s cleaner, clearer and tighter presentation over the AK70 - especially in the bass. The original’s precise, dynamic and open character remains very much the core of the AK70 mkII’s sonic signature, but there’s no doubt it raises the bar a notch. We play The National’s Carin at the Liquor Store and the loaded piano that gracefully weaves around the arrestingly dense vocal is pulled closer into your headspace, thanks to the A&K's improved clarity. It's accompanied by extra texture and layering. That improved transparency over its sibling is even more obvious when we switch to our hi-res music library. The AK70 mkII accepts PCM files up to 32bit/384kHz (although they are downsampled to 24bit/192kHz), as well as DSD 64/128 (converted to PCM 24bit/176 kHz for playback). We play R.E.M’s Pilgrimage (24bit/192kHz) and the thumping bassline and low-end piano melody have extra bite, as well as an even tighter relationship with the jangling rhythm guitars and bongos. That greater sense of togetherness and timing improves the overall cohesion of the sound, and overall it's a more compelling listen. It reveals more of Aretha Franklin’s vocal in Soul Serenade (24bit/192kHz) too, and the accompanying piano notes drip through the bluesy arrangement with a little more dynamic expression. Ultimately, the AK70 mkII offers a worthwhile sonic improvement over the original AK70. Despite the AK70 remaining the entry-level player in Astell & Kern’s music player line-up, the choice between the two is clear. Unless you have an unusually strong fondness for that mint finish.